One of the procedures that goods imported and distributed in the Russian Federation are subject to is state registration (SR). State registration certificate is issued upon this procedure and serves as safety evaluation of the certified goods. Only certified goods can be imported and distributed in Russia and in other countries that form the Customs Union. Up until recently, SRC could be obtained based on the valid sanitary and epidemiological certificate. However, as of January 1st all sanitary and epidemiological certificates were voided, and SRC can only be obtained upon proper testing. The list of goods subject to state registration is stimulated in the Common List compiled by the Customs Union on the basis of the Foreign Economic Activity Commodity Nomenclature (FEACN). State registration of these goods has to be performed prior to conformity assessment procedure. Goods that are not subject to state registration might be accompanied by a letter issued by the Russian Agency for Health and Consumer Rights (also known as Rospotrebnadzor) that is sometimes required for experts’ report. The Common List of goods compiled by Customs Union consists of 2 parts. Goods that are listed in Part I have to be accompanied by experts’ report. This document is conventionally facultative and might be obtained for goods that are not subject to state registration or in a situation when it is unclear whether goods are subject to state registration or not. In an unclear situation, the goods that are not listed in Part II of the Common List are somehow listed in Part III of the document. You can learn more about various types of safety evaluation of goods (experts’ report, ozone-depletion potential certificate, etc. ), by contacting ROSTEST. It is free and there isno obligation. 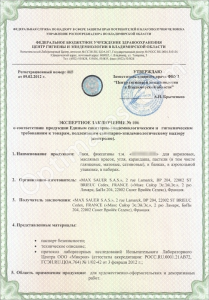 Russian law provides for delegation of certification procedures to an accredited third-party company. Contact ROSTEST certification center if you are looking for high-quality and prompt services.